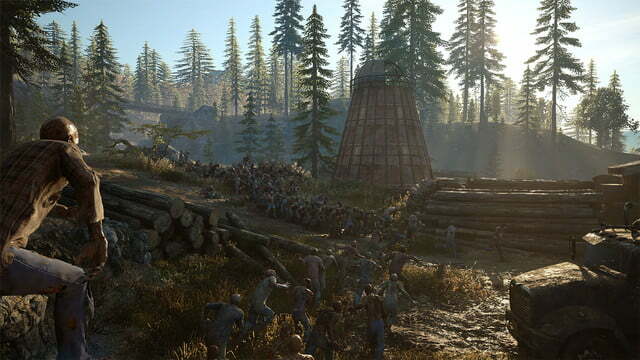 Zombie games are making a comeback this year. At E3 2016, developers announced the return of Dead Rising, State of Decay, and the mother of them all, Resident Evil. However, the most interesting of them, it seems, is a newcomer. 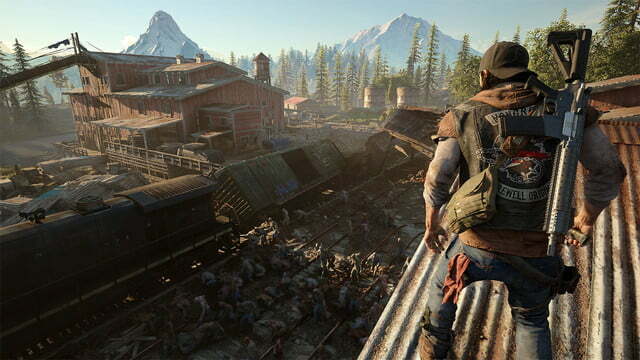 Days Gone, the PS4-exclusive open-world action game from Sony’s Bend Studio, seeks to raise the stakes of the zombie-survival genre with faster, smarter monsters, and systems that encourage players to find creative solutions for escaping them. 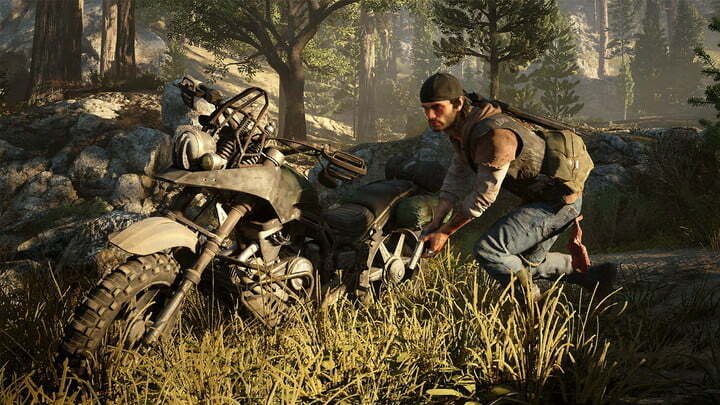 The story of Days Gone is effectively The Last of Us meets Sons of Anarchy. Players control Deacon St. John, a bike gang member turned bounty hunter living in a post-apocalyptic version of the Pacific Northwest. 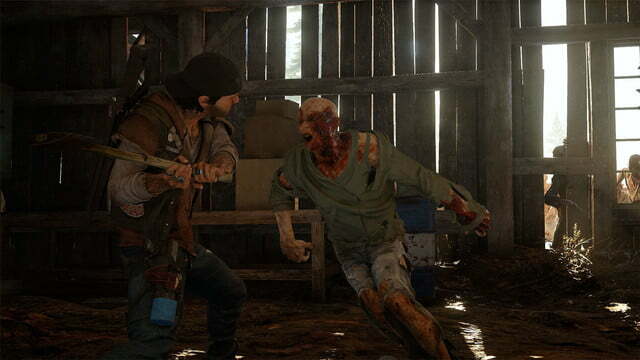 Two years prior to the events of the game, a global virus had turned a large portion of the population into rabid cannibalistic animals, which the developers refer to as “freakers.” No one really knows what caused the freaker pandemic, but the region has been overrun. The trailer for the game alludes to the fact that St. John may have lost a wife or girlfriend in the turmoil, leaving him to roam the infested land alone. Based on what’s been shown so far it could be the most intense apocalyptic survival thriller yet. Though we didn’t get to see much of that land, it was easy to see that Bend had put a lot of care into designing the woods where St. John lives. It makes sense that Bend Studio, named for its hometown, Bend, Oregon, would make sure to give this game a real sense of place. After all, it’s set in their neck of the woods. 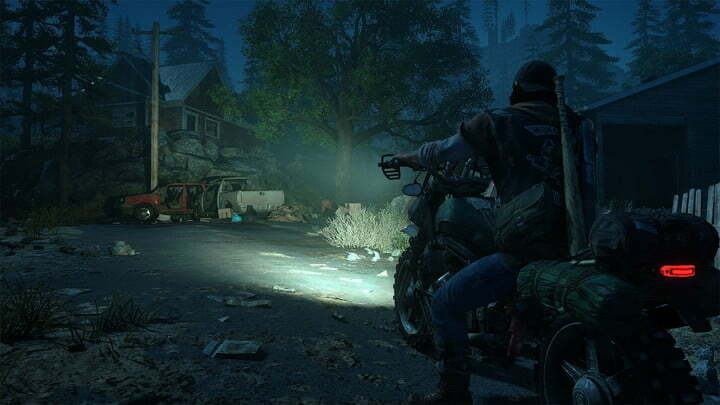 According to Bend, the game will feature dynamic weather, an essential, apparently, given the region’s fluctuating climate, and a full day/night cycle. It would be easy to simply hear that pitch and make a snap judgement, but that wouldn’t do the game justice, even the small bit of it that’s been shown so far (I do like the concept). In a closed-door session, we saw an extended version of the sequence Sony showed during its E3 2016 press conference. St. John chases a man named Two-Dog into an abandoned lumber mill, and winds up having to get away from hundreds of freakers who have caught his scent. St. John’s past life as a biker informs his skill-set. He can grab an oil filter out of a truck, which he snaps onto the end of a pistol as a make-shift silencer. It turns out that St. John’s mechanical handiness will help him plunder cars for a variety of parts, which he’ll be able to turn into many kinds of equipment, such as an air bag bomb. St. John’s bike is his primary mode of transportation and serves as an extended inventory. Before the mission we played, St. John grabbed a whole bunch of items out of his stash. 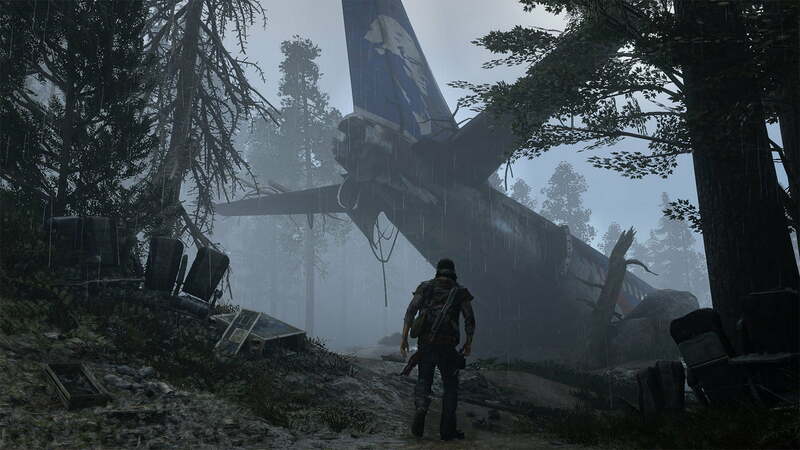 The implication is that players may need to manage resources wisely, and alternate between missions where St. John stockpiles supplies, and missions where he uses them. While St. John is the main character, the freaker horde is the star of the show. You can see dozens, sometimes hundreds, of freakers chasing St. John. In the fiction, the freakers have some sort of hive mind — Or at least the freakers we saw do. Bend Studios implied that there would be many types, which may have other abilities — which means when one freaker notices something, they all do. In an older game, this would serve as a reasonable excuse to use one AI to govern all the freakers. While it isn’t entirely set in stone how the dynamic between the freakers’ individual and group-think will work, but it appears that each one works autonomously. 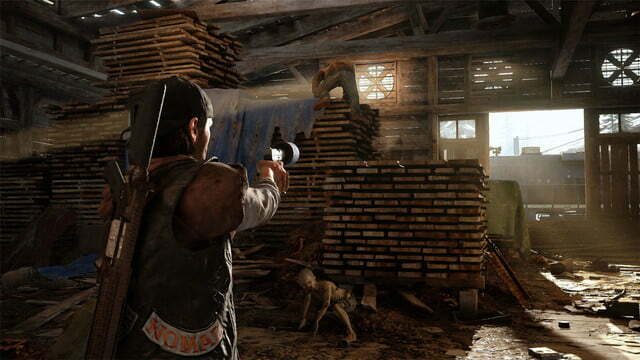 When St. John blocks their direct path with a Molotov cocktail, it takes a minute before one figures out how to hop over the roof: A few moments after the first couple hop over, a wave of non-zombies crests over the house. The trick to escaping a mob of that size, as you might have guessed, is crowd control. 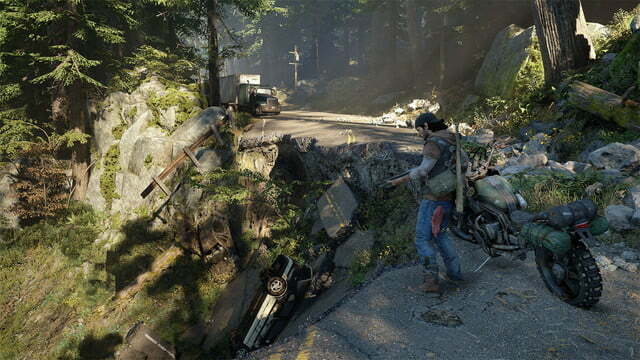 The Bend Studios designer, who’d played the demo many times, led the mob to choke points, such as doorways and narrow paths, then turned to shoot as many freakers as he could until they managed to clamber through. Knowing is only half the battle, though. The mill is littered with interactive points for St. John to move into the freakers’ way. 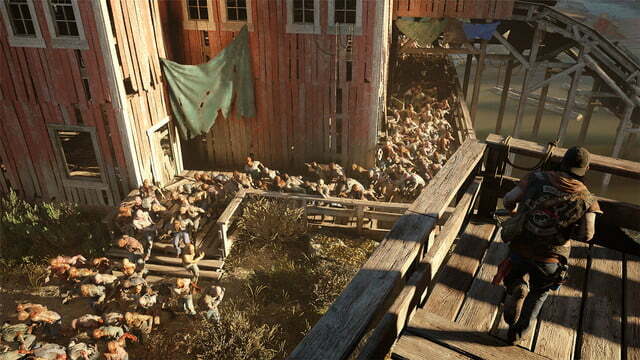 Running through the abandoned mill, St. John lowered a piece of conveyor belt, forcing the horde to go around. It didn’t stop them, but it gave him the time he needed to put a little extra distance between them and set a trap. 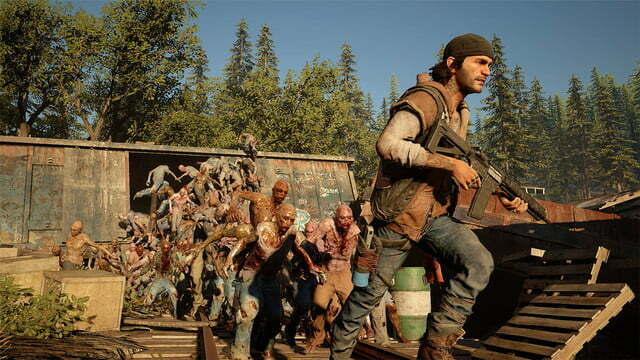 According to Bend, escaping a massive horde of freakers is a very specific experience, and only one of many that Days Gone will offer. Based on what’s been shown so far, however, it could be the most intense apocalyptic survival thriller yet.